"With the official Windows Phone 7 announcement going out yesterday, I wanted to let you know that we're working on a version of eWallet for Microsoft's new mobile OS! eWallet for Windows Phone 7 is designed to perfectly fit the look and feel of the new OS. It takes the best features of eWallet and adapts them to Window Phone 7's unique interface." It's great to see a long-time Windows Phone developer like Ilium making a commitment to the new platform! What you might be asking yourself is how can a digital wallet program like this work without file sync? By putting a bullet in the head of ActiveSync/Windows Mobile Device Center, Microsoft broke the link between desktop/laptop and your Windows Phone. Given the buggy history of both of those products, some might view that as a good thing - yet, bugs and all, it was important for me as a user to be able to put files onto and pull them off of my device. The Zune Desktop software allows you to sync media, but not files. 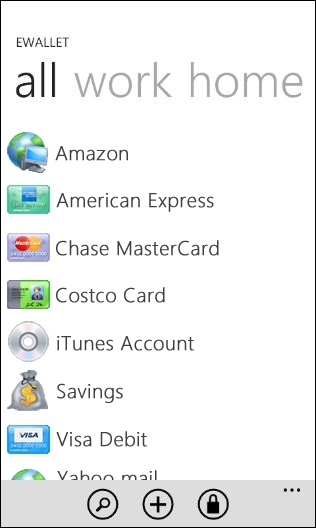 This breaks scenarios that are important to some people; I actually stopped using digital wallet software on my Windows Phone because I hated the dysfunction in the desktop sync experience so much, and because I used a hosted Exchange account [affiliate], I get everything I need without having to desktop sync. So how is Ilium performing this magic if there's no way for them to sync a wallet file to the phone? They're mum on the exact method for now (and, yes, I asked), but I think it's going to be one two ways in my opinion: they're either going to go via the cloud, or via a desktop software conduit. I really hope it's the former, and not the latter, because installing a desktop software app to sync one application is a poor solution for a variety of reasons. I'm going to guess that Ilium is going with a cloud-based solution; eWallet will do an encrypted record-level sync with their Web server. This is a flexible solution that makes multi-platform solutions easier, but given the type of ultra-important information people put in their digital wallets, there's certainly a concern about security. I wonder how Ilium is going to address that? Excellent topic! I'm on SPB Wallet (and haven't had the troubles on the desktop that you have had Jason), but would quickly migrate to eWallet if they support Windows Phone 7 shortly after launch (SPB Wallet has not made any such announcement). I actually didn't put "two and two together" to realize there's no desktop file sync, so I appreaciate the "heads up," and I too wonder how Illium will handle this? On a side note, when you dropped wallet syncronization due to Exchange Activesync, what did you do with all the wallet data? Did you enter it into Outlook in some manner, or did you just stopped carying that data on your device? I use FlexWallet on my desktop/laptop computers 20+ times a day - it's an invaluable tool for me. On my phone, it was handy to have that data with me, even if it wasn't always the newest version of it - but that also meant that I wouldn't ever update the data on my phone. It was a pretty broken scenario, and eventually just gave up and stopped installing FlexWallet on my phone. The other problem of course is that FlexWallet is an abandoned product - I tried eWallet about a year ago, and there were unfortunately many things I didn't like about how it worked. Speed of access - getting in and out fast - is really important to me with a digital wallet program, and eWallet simply didn't measure up to FlexWallet. I feel a bit like the the grumpy old man on the hill with a shotgun talking about no one ever taking my digital wallet software away...but I really love Flexwallet! lol! The only wallet as good or better than SPB Wallet *was* FlexWallet! That being said, did you ever give SPB Wallet a try? It's fast, simple, record level sync, and has worked great for me. Of course, now that Windows Phone 7 is iminent, and SPB Wallet has an internal policy of *not* announcing future plans / future platform support, you considering SPB Wallet now is probably too little, too late. I too hope eWallet for WP7 syncs via the cloud, and also addresses the other concerns you've had with it in the past. I've used eWallet for years on my PPCs, my WM phones, my desktop and now also on my iPad. One option would be to sync the WP7 version like they do the iPad via wifi. If you're on the same network as your desktop, you just open the app in both places and hit the sync button. It finds the other, asks for confirmation of the device and then syncs wirelessly. It's quicker and easier than the USB sync I do with my WM6.5 phone. I agree with Rob Alexander about the convenience of syncing via WiFi. I do that with eWallet on my iPhone as well. The issue comes when you have multiple desktop/device programs that need to sync and each needs to develop their own mechanism. You wind up having to open each one, some on both platforms, and initiate a sync, or be greated with failed sync notifications if the programmer didn't do a good job with an auto-sync when connectivity is not available. The WiFi sync for Zune works pretty well. It would be nice if MS openned that conduit for third parties to allow syncing of things like task lists, memory maps, electronic wallets, etc. Too many things in the cloud getting lost, or worse, available to all, for me to real comfortable putting everything in my eWallet out their. Good to see ilium is supporting WP7. Agreed on the WiFi. This makes the most sense in this scenario (i.e., security conscious consumer doesn't want to store this stuff in the cloud). However, isn't there a gorilla in the room? For me, the most useful part of these programs is being able to integrate with a browser for auto-fill and/or copy and paste the information into forms, emails, etc. Obviously WP7 supports neither browser extension nor copy/paste. Obviously there's the convenience of having a bunch of account info in your pocket, but is form filling not the #1 use of e-wallets for y'all? I was a big fan/user of the old FlexWallet program. I did migrate to eWallet for my Windows Mobile 6.5 device and it has been working fine. I haven't the issues Jason seems to have had, so, the program works fine for me. Relative to WP7, I think it is troubling to think that data that should be personal and secure (between your desktop computer and a smart phone) now (if Ilium chooses this option) has to be synchronized over "the cloud". Why should I now incur monthly expenses for cloud storage for data that doesn't need to be on a server outside of my home, but now has to because Microsoft wants a new revenue source? Does this make sense?? Obviously there's the convenience of having a bunch of account info in your pocket, but is form filling not the #1 use of e-wallets for y'all? Actually, the #1 use of eWallet, for me, is to have a bunch of passwords, software registrations information and frequent flyer numbers located in one easy to access location that travels with me and is there when I need it. Anything else is secondary. If you're on the same network as your desktop, you just open the app in both places and hit the sync button. It finds the other, asks for confirmation of the device and then syncs wirelessly. It's quicker and easier than the USB sync I do with my WM6.5 phone. What if your desktop's not on? Cloud sync is really the only non-ugly way to go - everything else is just bleh.